Under the rallying cry of “Inbound for Everyone Everywhere,” HubSpot hosted 14,000 customer, prospects, media and marketing mavens at its INBOUND 2015 customer and prospect event in Boston this week. At the event, CEO Brian Halligan and CTO Dharmesh Shah had little to say about the recent scandal that involves a manuscript allegedly stolen from an ex-employee, and resulted in the departure of two top HubSpot executives. Instead, Halligan and Shah focused on a slew of new products, and preached the gospel of making sales and marketing more relevant for today’s highly informed, socially connected, always-on customers. Back in the day, brands held most of the power, vendors were the power brokers, and marketing was all about the four Ps–product, price, place and promotion. Today, the digital, social and mobile revolution has changed buyer expectations of how vendors should market, sell and service them–and shifted the power to the buyer. With a tap of a smart phone, buyers can get information, ratings and opinions about you and your competitors. Marketers must evolve accordingly with valuable content, more effective engagements with prospects and customers and a customer-centric experience. Inbound marketing helps marketers realign by moving from a push approach to a content-driven, pull marketing one. HubSpot’s mission is to accelerate this shift. According to CEO Halligan, human-friendly, empathetic marketing strategies that “create value before trying to extract it out of the system” are key to empowering this evolution. To that end, HubSpot is focused on providing its customers with a system to automate, track and personalize content and engagement. Of course, HubSpot has plenty of company (practically every other marketing, CRM, sales automation and social vendor in the universe). 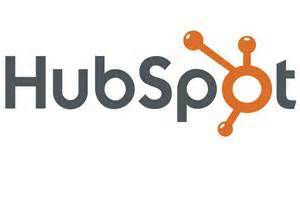 But to its credit, HubSpot has distinguished itself as an early pioneer in providing inbound solutions for SMBs. In addition, HubSpot has offered many free services over the years to help educate the market, including Website Grader, Twitter Grader, Twitter Grader, Press Release Grader and Facebook Grader. More recently, the vendor has launched free versions of HubSpot CRM and Sidekick, which provides users with pop-up information, such as past contact history, social media content, mutual connections, about their email recipients. Secure Socket Layer (SSL) for HubSpot websites. The “s” in an “ https” URL means that a website uses SSL security to encrypt the link between the website and a browser. Google is advocating for “HTTPS everywhere,” and rewarding sites that support SSL with more favorable rankings. Customers using HubSpot’s website platform can implement SSL in two clicks, for free. HubSpot Reporting Add-On, to help marketers and sales people “spend more time making the numbers, not reporting them.” For $200 a month, HubSpot Basic, Pro and Enterprise customers get access to a library of more than 20 prebuilt reports, and the ability to build their own custom reports. HubSpot’s Shah stated that the base product delivers “good” reporting, but the add-on is more comprehensive and provides visualization. HubSpot Ads Add-On. According to HubSpot, 80% of B2B marketers use at least 1 paid channel. Ads Add-On is designed to help customers create ads, manage paid channels, figure out what works and what doesn’t, and calculate returns. The solution works with Google AdWords and LinkedIn Sponsored updates, and is priced at $100 per month. Predictive Lead Scoring, which is available at no additional charge to HubSpot Enterprise edition customers only, is designed to replace subjective, human lead scoring with algorithmic, data-driven lead scoring base on behavior, demographics, and social and email actions. HubSpot’s rationale for offering this to Enterprise accounts only is that it’s not really a fit for Basic and Pro customers because the solution needs at least 500 customer contacts and 1,000 non-customer contacts to operate reliably, and that it will appeal to more sophisticated customers. HubSpot Connect, which integrates customer data from different apps together into a centralized system. For instance, you could integrate billing and payments data from FreshBooks, or customer service records from ZenDesk into HubSpot Connect for a more complete and organized view of your customers. Each integration is individually priced. Some are completely free, some require certain tiers of HubSpot and/or the integrating product, and some have an additional fee for the integration. Leadin, a new freemium offering from HubSpot Labs, is aimed at companies that want to get started with inbound marketing, but don’t have the time or money invest in the entry-level $200 per month HubSpot platform. It provides users with a tool to create a quick pop-up form to collect email addresses from visitors to your website. When they sign up, you get some information to help identify them, such as whether they are a first time visitor. LeadIn then takes all the contacts you capture and puts them in a centralized database. You can use LeadIn on WordPress and other non-HubSpot content management systems. Note that LeadIn offers a simple plug-in for WordPress.org sites, but things are trickier if you have a WordPress.com or other type of site. Connections, which provides an email graph so sales people can more easily understand the connections they have in an account. Prospects, which helps reps get more information about companies visiting your website. Sequences, a process tool to help sales people follow-up with prospects with automated, personalized emails. Meetings, which preps sales people with notes and timeline of interactions with the prospect before meetings. If the breadth of new products is any indicator, the departure of two key execs hasn’t appeared to slow HubSpot down in the product development area. Articulate, differentiate and segment its increasingly confusing solution portfolio for SMBs? 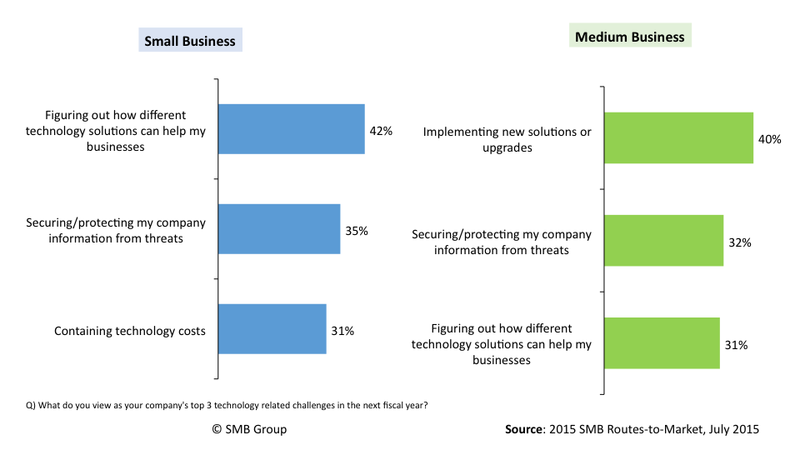 SMB Group’s 2015 SMB Routes to Market Study reveals that “figuring out how different technology solutions can help my business” is the number one technology challenge for small businesses, and the number three challenge for medium businesses (Figure 1). But I noticed that while HubSpot execs talked a lot about serving SMBs, they didn’t talk much how they are segmenting the SMB market. This will be critical to successfully cut through the confusion with most relevant and tailored education, marketing, channels and solutions. Rationalizing pricing and packaging for HubSpot’s paying customers. As I tweeted, it seemed a bit disconcerting that HubSpot users have to pay extra to get more comprehensive reporting capabilities. It will be interesting to see what percentage of the installed based ends up biting on the add-ons that come with a price tag, and if there will be push back here. Meanwhile, predictive lead scoring is only available to HubSpot Enterprise ($2,400 per month) customers. While the pricing rationale makes sense to HubSpot, I’m not sure that it will be that clear to customers and prospects. Monetizing the freemiums. HubSpot has significantly expanded its freemium offerings in a push to create viral entry points that hypothetically will enable it to engage with a broader cross-section of the potential market. However, we didn’t hear much about HubSpot’s strategy and success metrics for attaining and converting freemium customers. HubSpot continues to do a stellar job in leading the inbound movement, and developing some of the most innovative solutions in this area. Ironically, however, as it grows its portfolio, HubSpot itself now faces some new inbound marketing challenges of its own. Previous Previous post: How Well Do You Know The Very Small Businesses That You Want to Sell To?